The Japanese government is promoting the Cross-ministerial Strategic Innovation Program (SIP) spearheaded by the Council for Science, Technology and Innovation since 2014. It aims to contribute to the resurgence of the Japanese economy and deliver solutions to a variety of issues confronting society through the strengths of science, technology and innovative systems. The SIP has identified eleven themes including energy, infrastructure and disaster prevention that should be addressed by collaboration among a variety of industries, public agencies and academia as well as ministerial bodies. One example of the themes is Automated Driving for Universal Services (SIP-adus). The SIP-adus project aims to reduce the amount of traffic accidents, ease congestion and create an advanced transit bus system that is easily accessible by the elderly and other vulnerable populations with limited mobility by the system’s widespread realization. The government has announced the target as fewer than 2,500 annual traffic fatalities by 2020, down from 4,000 at present (3,904 in 2016). It is expected that the automated driving system will play a significant role in preventing the occurrence of human error that is usually the main cause of traffic accidents. The development of Dynamic Map is one of the high-priority themes to be addressed in the cooperative areas. Dynamic Map is a 3D digital map for automated driving, integrating “static data” (or a high definition 3D map) with “dynamic data”. “Static data” refers to information related to road width, stop signs, lanes, traffic signs and buildings for example, while “dynamic data” refers to road traffic control, road construction, weather conditions, present information about traffic lights and pedestrians on the road, and so on. Compared with the existing car navigation systems, Dynamic Map is capable of processing a much greater amount of information than conventional car navigation systems, and can grasp location of the car and circumstances of the surrounding area seamlessly with a high degree of accuracy by transferring driving information gathered from various sources including the GPS system and road information infrastructure to Dynamic Map. Under this project, the SIP-adus has been taking active steps to develop technologies and schemes to gather the necessary information and data for the Dynamic Map system. For example, the high definition 3D map, which plays a fundamental role in the system, has been constructed with GPS information as well as cameras and sensors for measuring installed in moving cars. Dynamic Map Platform Co., Ltd. was founded in June 2017. Jointly established by Innovation Network Corporation of Japan, an electronics company, auto manufacturers and mapping service providers, the new company has started to create high-precision three-dimensional map data related to the nationwide expressways and motorways. “The development of Dynamic Map is indeed one of the significant achievements of our SIP-adus project. We have determined the specifications regarding the static data comprised of information related to driving lanes and traffic signs. At present, Japan has officially made a proposal to the International Standards Organization (ISO) regarding the international standardization of the static data,” says Chikuma. 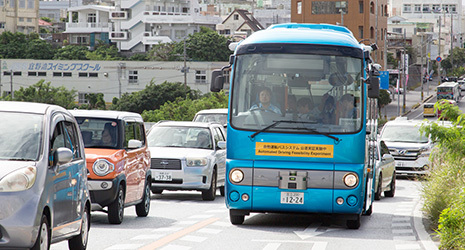 In March 2017, a demonstration experiment was launched using a small driver-assisted bus on public roads in Okinawa. The bus moves forward and turns by automatically accelerating and controlling the steering wheel. It also independently decelerates and stops just before a stop line, avoiding an accident with any vehicle parked on the side of the road. The demonstration experiment verifies these automated control technologies. Testing the precise docking system is also part of the demonstration experiment. This technology makes it possible for a bus to pull over at a bus stop without leaving a gap. In October 2017, the same demonstration experiment also launched an experimental project to test an automated driving system for a transit bus, using signals received from Quasi-Zenith Satellite System “Michibiki” (see here). The signals that can locate the vehicle with negligible errors in distance will be processed as part of the high-definition 3D map. During the same month, in the metropolitan area, a large-scale field operational test for automated driving systems was launched, involving twenty-one organizations and auto manufacturers from both Japan and abroad. This project involves a road test using prototype data from Dynamic Map and activities to collect data on the state of the driver during long-distance driving, which is known as a human-machine interface (or HMI in short). The test has been conducted on a 300-km section of the Shuto Expressway and Tomei Expressway. HMI is a technology that interfaces smoothly between a driver and the system operations. During the demonstration experiment, camera-assisted monitoring of the driver’s behavior has been used to collect data on the driver’s degree of concentration while driving and the correlation between automated driving and driver drowsiness. The Japanese government plans to introduce transit buses as supporting drivers using the precise docking technology capable of pulling over at a bus stop with precision for the 2020 Tokyo Olympic/Paralympic Games. The traffic system in Japan is expected to become more sophisticated with 2020 as an important milestone.